And hardened by the centuries. Today is the Summer Solstice, the longest day of the year, and it is also the Feast Day for the Archangel Uriel whose name translates as "God is my Light." In many churches and texts, you hardly hear about this angel, but this being is one most important in the angelic hierarchy and in his duties to God. From sacred texts, Uriel is said to have guarded the Gates of Eden as well as being the guiding angel that led John the Baptist and his family to Egypt during the massacre ordered by King Herod. Uriel is also said to have warned Noah about the impending Great Flood that God was sending. 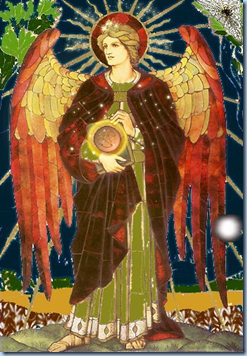 Uriel is considered an Archangel of Light as he guards and protects the time of summer and the summer solstice. 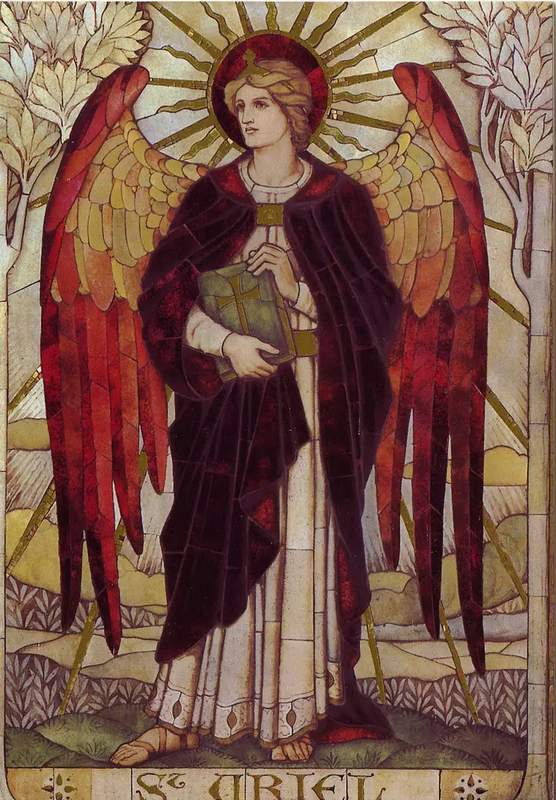 He is the Angel of Wisdom (sometimes referred to as "Keeper of the Mysteries") as he is said to carry the supreme knowledge of all that is; likely, this is from his being also one of the Angels of Presence (an angel who is allowed to enter the very presence of God). He is associated with the Suit of Coins (or Pentacles) in Tarot and as such he is sometimes depicted holding a coin or a pentacle while at others he is shown holding a book to denote the divine wisdom he holds. This archangel is associated with the element of Earth and the cardinal direction of North. 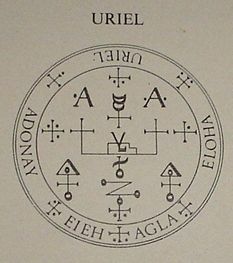 It might seem ironic that, particularly in Masonic circles, the North is associated with darkness, but I believe he is associated with North because, like the element of Earth, it is associated with death or mortality as Uriel is referred to as the Angel of Death. He should not be feared though as he will bring us from this mortal shell and returning to Wholeness with the Most High God. The Chariot represents forward movement, success, overcoming obstacles, and traveling. 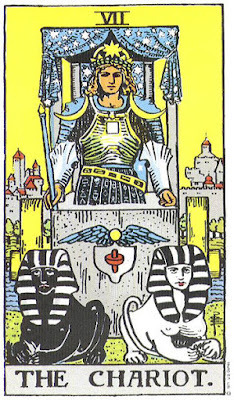 The Chariot is associated with a triumphant victory as well as a departure from traditional ideas. It should also be remembered that it is very little you can do to stop the onward motion of the chariot. The card depicts an armor-clad male figure standing in a chariot. The man has a yellow crescent moon with a blue face on each shoulder, a square on his breastplate, alchemical symbols on his garments, stars in the crown upon his head, and carrying a wand. A canopy supported by four pillars with a veil that is light blue and covered in white stars. The chariot is cube-shaped and has a winged shield on the front. 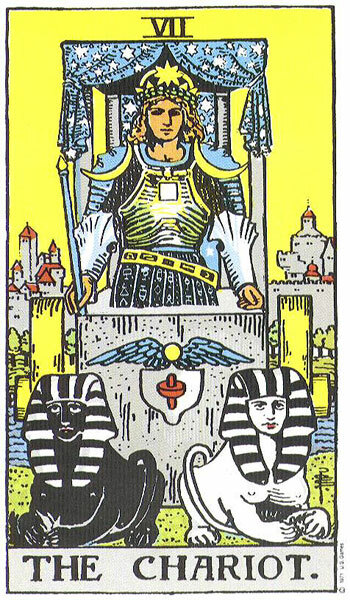 The chariot is being drawn by two sphinxes: one is black and one is white. Being clad in armor represents the Charioteer's preparedness to work for results. The moons symbolize new beginnings. The cube shape of the chariot is to represent stability and perfection of work. The crown of stars represents that the Charioteer is enlightened while the square on his chest symbolizes the material world. The 5-pointed star is a symbol used by many cultures and religions; Christians used it to represent the five wounds Christ suffered on the cross. The 6-pointed stars represent the Seal of Solomon, a common talisman. The 8-pointed star on the crown symbolizes balance, harmony, order, and justice. Carrying a wand or a staff is a mark of authority and we see this with the king's scepter, the bishop's or verger's staff, the mace of Parliament, and, Biblically, with the staff of Moses. I find many similarities between the star-covered canopy with the paper: Celestial Clothing. The two sphinxes being opposing colors and facing different directions represent balance and duality: male and female, light and darkness, life and death, material and spiritual. They also remind us of the pillars of the High Priestess. As one sphinx represents emotions and one intellect, the charioteer must master so they will draw the chariot in one direction. The concept of a "union" is one of the more important messages of the Chariot. In a previous article, Introduction to Hermeticism, I briefly discuss Hermes Trismegistus, the legendary figure who is credited with the philosophical movement known as Hermeticism. Hermes Trismegistus is credited with writing the Corpus Hermeticum, one of the foundation documents of Hermeticism, as well as the Emerald Tablets and many other sacred writings. The Emerald Tablets are considered a pillar of Western alchemy and esotericism. The emerald tablets are a series of stones supposedly inscribed with the secrets of the universe, particularly the secrets to alchemy. While there are a variety of legends that date the tablets to various times of antiquity, the oldest documented source is in "Kitab Balaniyus al-Hakim fi'l-`Ilal Kitāb sirr al-ḫalīqa" (كتاب سر الخليقة و صنعة الطبيعة أو كتاب العلل للحكيم بلنياس), a composite of earlier works attributed to Balinas (possibly a pseudonym of Apollonius of Tyna) and dated to sometime between the 6th and 8th centuries. In this book, Balinas lays out the framework of the Emerald Tablets. He says he found them in a vault beneath a statue of Hermes in the city of Tyana (now located in Turkey). The Emerald Tablets would go on to be a centerpiece for medieval alchemical movements. It was first translated to Latin the 12th century by Hugo of Santalla. After that, it has been translated by Johannes Trithemius, Roger Bacon, Michael Maier, Albertus Magnus, Isaac Newton, Aleister Crowley, and Helena Blavatsky. There are variety of legends as to the origins of the Emerald Tablets. The most common is that they were authored by Thoth, an Atlantean Priest-King. Thoth is said to have been an immortal who chose when he would leave the mortal world. At the destruction of Atlantis, he established a colony near ancient Egypt. He is said to have ruled over other colonies located near Central and South America which is said to influence the Mayan culture. Thoth ruled from 52,000 BC to 36,000 BC, and at the end of his reign, legend states, that it was him who built the Great Pyramid at Giza, not Pharaoh Khufu (also known as Cheops), in order to safeguard the ancient wisdom of Atlantis. According to legend, the Great Pyramid of Egypt has been and still is considered a temple of initiation into the mysteries. The pyramid was placed over another structure known as Great Halls of Amenti. As time progressed in ancient Egypt, Thoth was adopted into their pantheon, being known as the God of Wisdom and Scribe of the Gods. Thoth is said to have three reincarnations, the last being Hermes Trismegistus who authored the Emerald Tablets and which were left with the pyramid priests who protected the Great Halls of Amenti. The Emerald Tablets are described as being ten in number, each composed of a green stone impervious to the ravages of time, resistant to all substances, and interconnected to each other by gold rings. The Tablets were written in an ancient Atlantean language where the characters respond to attuned thought waves, releasing the associated mental vibration in the mind of the reader. The Tablets contain the history of Atlantis, its destruction, the diaspora of Thoth and his followers to Egypt, the building of the Great Pyramid at Giza, the Halls of Amenti, and the keys to alchemy and ancient wisdom which would result in atonement. Some legends of the Tablets tie it in with the Abrahamic religions where it is believed that a son of Adam and Eve wrote them, and that they were once held within the Ark of the Covenant. Within Christianity, it has been praised by some while others have condemned it as heretical. 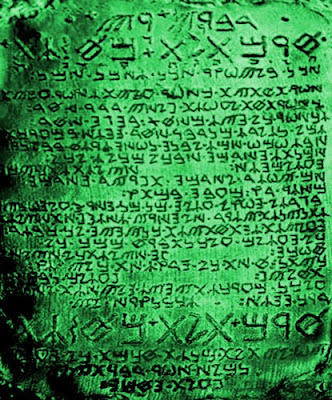 The Emerald Tablets have a foggy history which has given rise to many myths and legends surrounding these artifacts and its assumed author, Hermes Trismegistus. It is said that during the 16th century, Hermes Trismegistus was so revered that his teachings started to replace Aristotle's in European school. So too today are the Tablets still highly regarded by those who seek to truly understand them and not just a temporary fancy.